A new era has come Technologies are changing the world. What previously seemed to be impossible, today is already the reality. The time for changes in nuclear physics has come. It’s time to save the planet.So,let us understand what project synthestech . What the Project SYNTHESTECH is all about ? This project is all about mastering the technology for cold transmutation of chemical elements. Cold Transmutation (LENR) of chemical elements — is a breakthrough, innovative technology for transforming one chemical element into another. Cheap elements into precious ones. It is a possibility of obtaining platinum group metals and other valuable elements, including gold, from cheap raw materials by artificial means. Ability to synthesise chemical elements will change the economy in a much more significant way, compared to even blockchain technology. Phenomenon of Cold Transmutation was discovered in recent decades. SYNTHESTECH group is developing this technology; they have conducted hundreds of experiments and achieved phenomenal results. Among those results is obtaining of platinum group metals. Blockchain — is a technology for recording information about values and its transaction; it is virtual information. Cold Transmutation — is a method of producing values, physical and objective. Most Important Question is will the Project be Commercially Viable ? The technology of Cold Transmutation of chemical elements (LENR-Transmutation) is an area that has enormous commercial potential. Elements that can be obtained using cold transmutation, will be in great demand in finance, industry, medicine in finance, industry, medicine. Application of this technology can lead to creation of new industries. The added value and profit can reach thousands of percent. 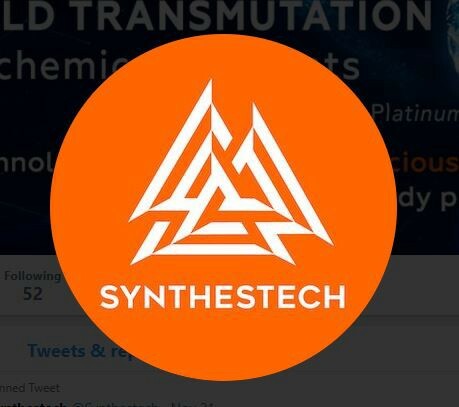 Capitalization of the project can grow ten-folds immediately after the new “Synthestech” laboratory starts to operate. Will There Be any Market for artificial METALS ? To understand this let us take the example of one of the most precious metal Platinum . It is well known that the global platinum market (not taking other metals of the platinum group) is currently about 8 billion US dollars. What makes this metal irreplaceable? Platinum is a chemical element of the transitional metals group, period 6 of the Mendeleev’s periodic table and, due to its unique properties, belongs to the group of noble metals. Because of the very low abundance in the Earth’s crust, platinum is considered rare-earth element and almost never occurs in its pure form. Today, the demand for this precious metal is steadily growing. Platinum’s unique chemical and physical properties enable it to find applications in a wide range of industries and national economy. Due to the vast trading market for platinum, the demand for this metal always remains high, which is the key to high prices. The World Platinum Investment Council (WPIC) Platinum Quarterly predicted platinum market deficit of 15,000 ounces this year. According to WPIC, platinum demand will grow by 2% in 2018 reaching 8.03 million ounces and the deficit in the market will remain for at least the next six years. The increase in use of platinum autocatalysts also makes a significant impact on demand, since almost all new cars are equipped with Emissions control systems. Also, don’t forget that the natural reserves are depleting, which makes platinum mining more complicated. And Here Comes the Team of SYNTHESTECH. It directs its forces to the development of technology for the artificial synthesis of platinum group metals. The industrial production of platinum through the cold transmutation of chemical elements (LENR / Cold Fusion) will make platinum more available for use in industry, medicine, finance, jewelry. This allows us to be confident that the ready market for platinum is guaranteed.